Located in the Southern Ari Atoll — Lily Beach Resort & Spa can be reached by a short and a scenic 25 minutes Sea Plane Maldivian Air Taxi (MAT) flight from Ibrahim Nasir International Airport. The Premium All Inclusive Platinum Plan at Lily Beach Resort & Spa, reveals a world of affordable luxury and unencumbered enjoyment. The Platinum Plan delivers the promise of an untroubled break. Carefree dining, wide range of facilities and activities and freedom to explore the beauty of the Maldivian islands world – The luxury all-inclusive concept guarantees a calculable all-round package that leaves no wish unfulfilled. The mix of luxurious comfort and graceful leisureliness is achieved wonderfully. The 125 villas spread across the island will delight even the most pampered holidaymaker. The 69 Beach Villas, 36 Deluxe Water Villas, 16 Lagoon Villas and 4 Sunset Water Suites display unmistakable character and style. Each residence is a private paradise within a paradise. The beauty of the Maldives is revealed not only above, but also below the water. The almost untouched Ari Atoll is habitat for a unique range of exotic fishes and colourful corals. The area around Huvahendhoo is one of the finest diving spots in the world. Lily Beach’s own House Reef, just a few fin strokes from the beach, offers a spectacular underwater scenario of its own. With the experienced experts of the “Prodivers” Centre at hand to assist, divers can explore wrecks, observe colourful shoals of fish, reef sharks, turtles, mantas, eagle rays and dolphins. With a little luck it is even possible to glide through the water beside a whale shark. A new dimension of well-being. Accompanied by the meditative whoosh of the Indian Ocean, body and soul embark on a holistic journey of absolute relaxation. Time and space lose their significance, all that counts is pure well-being. Tamara Spa by Mandara reveals holistic therapies that go far beyond those of a typical spa experience. Inspired by the various rejuvenating practices of different cultures, various techniques and philosophies are combined in a selected spa portfolio that delivers a perfect wellness experience. Traditional Asian health and beauty applications blended with highly-sophisticated, modern spa techniques, deliver both benevolent relaxation and vitalising energy. In efforts to ensure that the resort’s youngest guests also enjoy a fulfilling holiday the resort offers a range of children’s programmes, providing for an adventurous and exciting holiday. A creative and experienced team is on hand to assist the young guests in the numerous indoor and outdoor activities. The facilities include play areas both indoors and outdoors. Activities include treasure hunts, painting, sandcastle building and a guided tour of the island. Babysitting is available on request, for a fee. At the Turtles kids’ club children between the ages of three. The Beach Villas allow you to make full use of the beautiful natural playground, right on your doorstep. The Villas are nestled amidst lush vegetation, steps away from the balmy Indian Ocean, and within minutes walk from the resort’s main area. If you enjoy waking up to the sound of swaying palm trees and you are certain that you will admire the blue and white colour tones of the Maldives, the Beach Villas are exactly what you are looking for. All those typical Maldivian elements are close by: the sea and the beach for endless fun in the sun, loungers on your private, shaded deck for when the temperatures peak, and the dining and leisure facilities within easy reach. 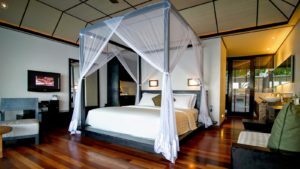 Whether you want to take it easy during your stay at Lily Beach Resort & Spa or you are after an active break, you will look forward to coming back to your chic Villa to recline in your favourite spot and keep falling in love with the paradise-like setting and the elegance that blends perfectly into it. 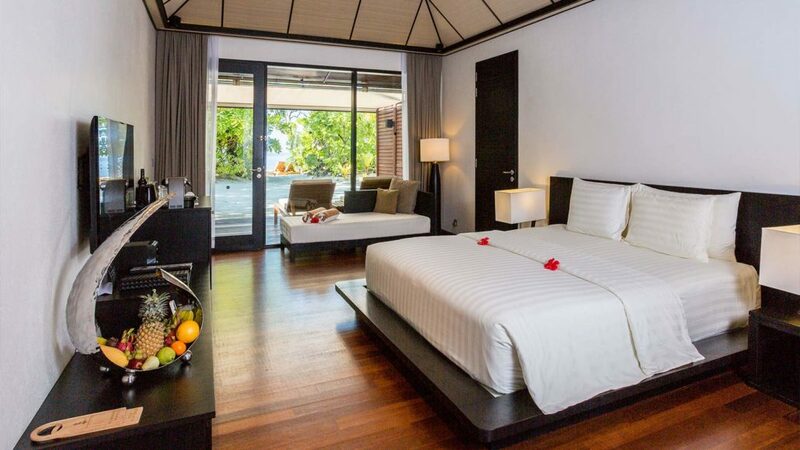 For the convenience of families and small groups, the resort offers 6 units of 2 interconnected Beach Villas. 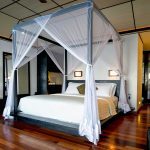 To comfortably accommodate families into the Villas, one room will contain a queen sized bed, with the second Villa offering twin beds. For their private terrace with direct access to the lagoon and the tropical surrounding, the Lagoon Villas are a favourite for many of the resort’s guests. Allowing you to laze away, soak up the sun and the sea, while letting the horizon steal away your thoughts, is something that no luxury holiday in the Maldives is complete without. The Lagoon Villas at Lily Beach Resort & Spa offer 5-star luxury indulgence with an unpretentious, distinctively Maldivian charm. You will be fascinated by the colours the morning sun puts on display and by how the glimmering lagoon awakens right in front of your Villa. 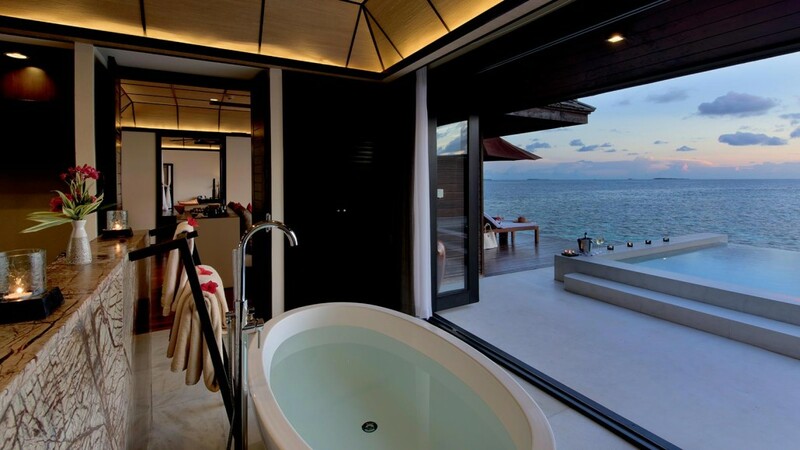 Spoil yourself and your partner with some romance in your outdoor Jacuzzi bathtub. The Lagoon Villas are close to the island’s facilities, allowing you to be nearby the evening entertainment, yet still offer privacy and intimacy that only gets disturbed by the gentle splashing of the sea against the beach just meters away from your Villa. 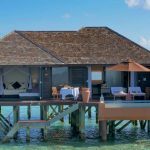 The Deluxe Water Villas at Lily Beach Resort & Spa provide the perfect option for those who are looking for intimate privacy in a simple yet incredibly stylish manner. 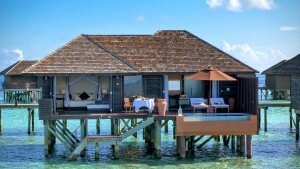 Capturing the heart and soul of the Maldives, these Villas offer elegance and luxury with nature right at the door. Hovering above the lapping waves of the Indian Ocean, the Deluxe Water Villas offer uninterrupted views of the endless blue and provide a true 5-star luxury experience that will remain embedded in the memory long after the holiday has ended. Pick your perfect area to kick back, relax and enjoy your partner’s company to the fullest. While away the hours enjoying the tranquility. Relax on your private deck or cool off in the Jacuzzi plunge pool after a long day of snorkelling on the stunning reef just a few meters away. The Deluxe Water Villas also feature a glass floor section, helping to top off the over water experience. Let yourself drift away to the music and beat of the ocean that is the backdrop to the Deluxe Water Villas. 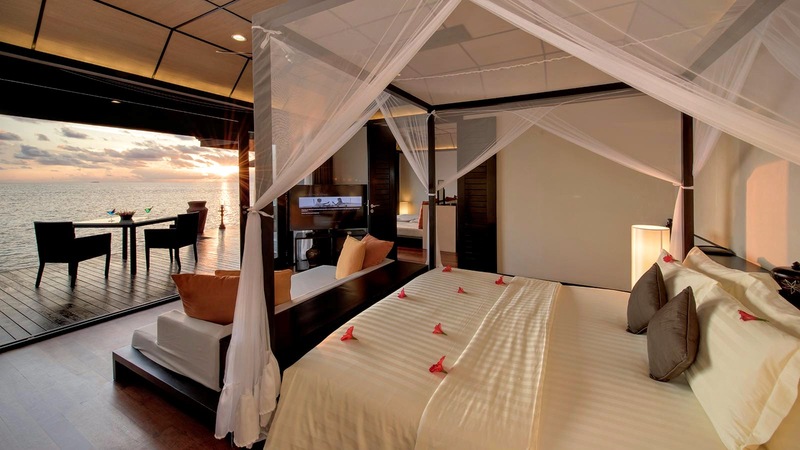 Beauty lies in the eyes of the beholder, yet all eyes love what they see in and around the Sunset Water Suites. From when you catch the first glimpse of your suite through the seaplane window, to the thrill and the excitement as you wind your way to your villa, your Sunset Water Suite is just like you pictured it; these quintessential Maldives’ over-the-water suites will leave everyone and anyone wowed. 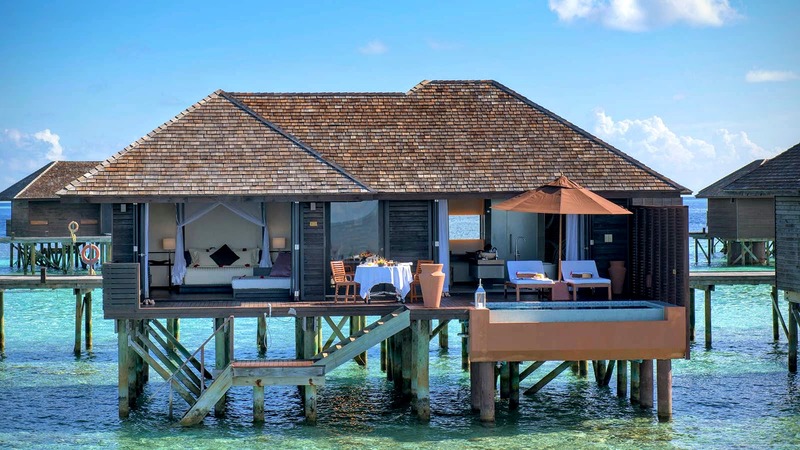 If you want your long-awaited and well-deserved holiday to be spot on, these grandiose residences, built on wooden stilts over the Indian Ocean, are a safe bet. 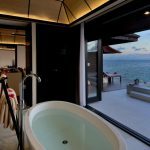 Their marvelous design, capped off with unobstructed views of the glimmering ocean – be it from your own private infinity pool, the Jacuzzi bath tub, or the comfy loungers – will raise the bar for what you consider a true five-star experience to be. Should the out-of-the-way location right at the end of the walkway not suffice to tick the perfect box, then the exhilaration when you slip into the crystalline water from the sundeck for sure will. Not to mention the 24 hour personal butler service. To make the long story short: soak in the luxury and live out your fantasies – life doesn’t get any better than this! With all of us craving to spend more quality time with loved ones, the Family Beach Villas were created with the much-needed family bonding in mind. Located steps away from the inviting lagoon and close to all the facilities, these interconnected Villas are bound to help you make the most of your time in this little island paradise. A true home away from home. Here, nothing stands in the way of making time for your kids. Spend some fun time in the sun. Splash away in the balmy water. Make sand angels. And imagine the overflow of excitement when you and the kids get to see all the flamboyant reef fish just below the water surface for the very first time, priceless. 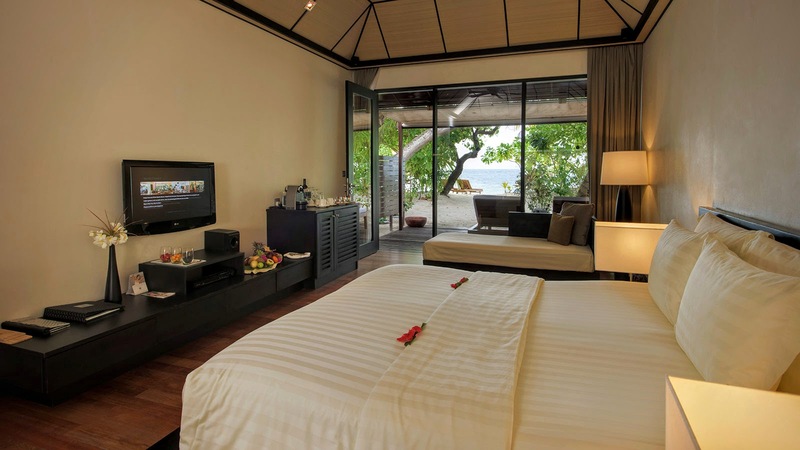 The Family Beach Villas offer the same services and facilities as the regular Beach Villas. Access to each of the Villas in the Family unit is via a door inside the Villas themselves. 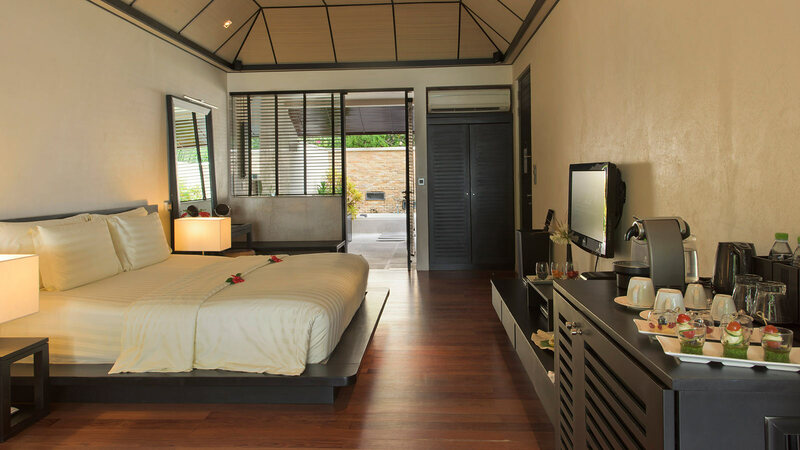 One of the Villas features a queen sized bed (recommended for mum and dad), with the second Villa offering a twin bed.